This post is via Shaman Sisters, Elephant’s Mindful Partner. We’re honored to work with them—they’re dedicated to ethically sourcing the finest crystals, gemstones, and spiritual tools to uplift your spirit so you can live your most fulfilling life. ~ ed. 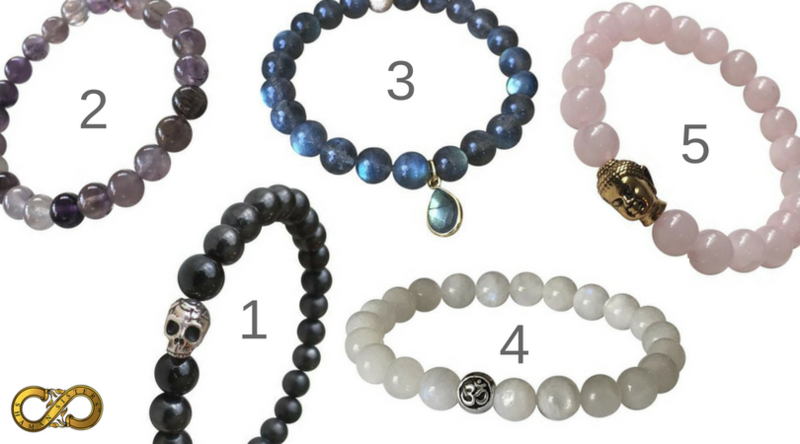 A Skeptic’s Intro to the Healing Benefits of Crystals & Gemstones. I was skeptical about crystals and gemstones too, at first. As a Registered Nurse, I was trained in a conventional, scientific way—in nursing everything is based on scientific proof and evidence based practice. So I really questioned anything that didn’t fit into this western scientific framework…until I started to learn about energy. What I learned as a nurse barely scratched the surface of topics like the aura and chakras, also known as energy systems of the human body. When I first learned about these energy systems, I remember questioning why so much emphasis is put on the physical when in fact all illness starts in the energy body before it manifests in the physical body. The practical reality is that everything is energy, everything has a frequency. In life, we are in constant contact with other peoples’ energy fields—positive or negative—and we are picking up their vibration in our own electromagnetic field (aura). Our work environments are one of the main places we come into contact with others and working in hospitals exposes us to a lot of unwell people with congested energy in their auras and chakras. Crystals are a powerful tool given to us by the earth for us to help cleanse and protect our energy fields. Shungite, similar to black tourmaline, protects from negative energies of all kinds and is great for healers, empaths, yogis…anyone really, because even if we don’t realize it, we are all affected by energies in the environment. Auralite23 stimulates higher awareness, enhances creativity, clears and charges all the chakras. This unique stone comprised mainly of Amethyst and also containing up to 23 different highly beneficial minerals. This gem powerfully dispels worries and fears, replacing them with self-confidence, adventure, and inspiration. You want this stone as an ally during times of change as it imparts strength, will, insight, and clarity to make decisions. Moonstone resonates with the energies of the New Moon—beneficial for new beginnings, emotional healing, and stress reduction, giving you a seamless mixture of both harmony and peace. Rose Quartz both attracts love to us and allows us to give love by opening up our heart chakra. This crystal connects us to the divine perfection of all that is. Rose Quartz helps to clear negative emotions, release stress, calm the mind, and bring back the joy in ones life. I remember when I was in my first year as a new nurse, feeling exhausted, unbalanced, and stressed out—this is ended up being a blessing in disguise that led me to learning about crystals. I went to see a Shamanic Healer and the first thing she told me was that my aura and chakras were full of dirty energy. She cleansed my energy field and taught me how to protect myself and my home with a stone called black tourmaline. I remember being skeptical at the time, but I was prepared to try anything. For me, the proof was in the results. I wore black tourmaline for years working in many different hospitals and there is no doubt that it made a difference for me: I felt calmer, more grounded, my energy levels increased, and I was able to handle a lot more stress. On days when I forgot to wear it, I could really feel the difference. I would get home feeling totally “off” and drained. That is how my love for crystals began and why I created Shaman Sisters jewelry. Black Tourmaline had undoubtedly changed my life and now I work with crystals for pretty much everything. Every crystal has a unique frequency which they emit into the environment. They also store energy. The cells in the human body vibrate at certain frequencies, as do the chakras and our aura. So, when we come into contact with a crystal (by wearing it as jewelry or holding it in our hand), we bring it into our energy field, its vibration interacts with the vibration of the cells in our body, and our frequency begins to raise to match its frequency. Every crystal has a different frequency and will bring different benefits to us, depending on its composition and colour. 1. Shungite is a powerful protective stone, similar to black tourmaline. It is great for healers, empaths, yogis…anyone really, because even if we don’t realize it, we are all affected by energies in the environment. Shungite is an ancient stone, believed to be almost 2 billion years old. It was formed when there were no life forms on earth, deep within the earth’s crust. The main deposit of shungite on earth comes from the Zazhoginskoye deposit near Lake Onega in the Shunga region of Karelia, North West of Russia. Shungite protects from negative energies of all kinds. I especially like shungite for its EMF Protection—we are bombarded by WiFi and electromagnetic frequencies 24/7. These disrupt our energetic field and negatively affect the cells in our body, leaving us feeling drained, frazzled, and out of balance. Shungite has been scientifically tested and proven to neutralize EMFs. “Shungite cures, rescues, purifies, heals, protects, normalizes, restores and even stimulates the growth. It kills and devours anything that harms people and other living beings, and concentrates and restores all that is good. The scholars who have studied Shungite in one voice declare, it is a miracle! ” ~ A. Doronina, Shungite—the Stone-Savior. Shungite clears, activates, and aligns all chakras. 2. 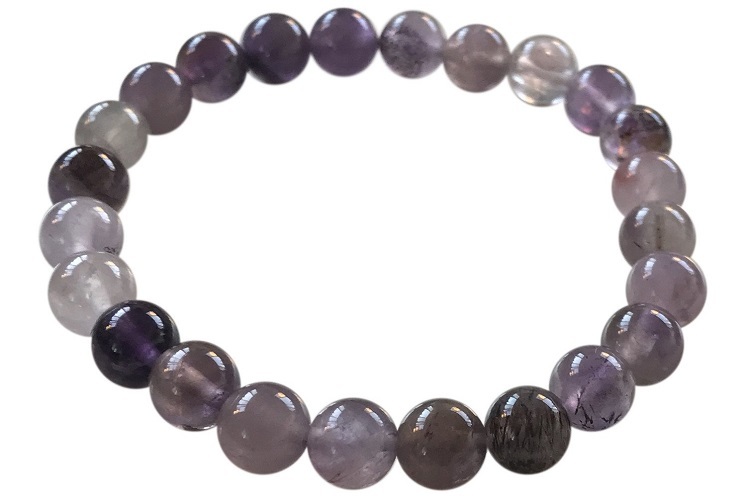 Auralite23 is a gemstone of awakening on every level and carries one of the highest frequencies of all the stones I have worked with. It is such a beautiful and unique stone comprised mainly of Amethyst and also containing up to 23 different highly beneficial minerals: Titanite, Cacoxenite, Lepidocrosite, Ajoite, Hematite, Magnetite, Pyrite, Geothite, Pyrolusite, Gold, Silver, Platinum, Nickel, Copper, Iron, Limonite, Shpalerite, Covellite, Chalcopyrite, Gilalite, Epidote, Bronite, and Rutile. Auralite23 stimulates higher awareness, enhances creativity, clears and charges all the chakras. This 1.5 billion year old gemstone is one of the world’s oldest crystals, mined in the Boreal forest of the Canadian Shield. It is thought that meteors hit the earth and the impact brought rare metallic ores to the surface, where they eventually dissolved and were incorporated into the growing Auralite crystal. A stone of rejuvenation and regeneration, Auralite23 helps to recalibrate and rebalance the body, bringing it back to its natural state. This high vibrational gemstone clears and aligns the third eye and crown chakras, while also keeping the root chakra grounded and activating the higher chakras, including the Soul Star (8th chakra) and above, thus, making it beneficial for soul travel, meditation, enhancing psychic abilities, lucid dreaming, connecting with angels, and past life remembrance—this work all stimulates the release of emotional wounding, karmic patterns, bringing soul healing, and connection to one’s higher purpose. Auralite23 helps with sleeping, anxiety, and depression—it brings a sense of peace, trust, and calm as old destructive ways of being are dissolved. 3. 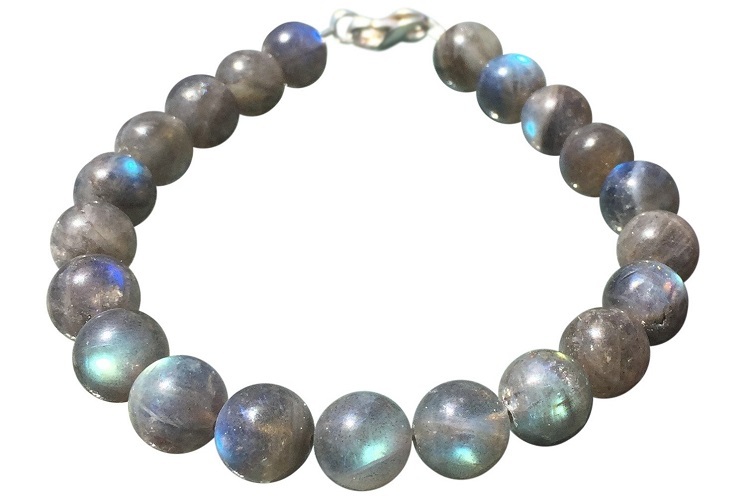 Labradorite is a gemstone you want to turn to when you’re feeling stuck in your life. I notice every time I am about to have a big shift and leap to a higher level of consciousness where change is in the air and synchronicity surrounds me, Labradorite is showing up in my life. I am mesmerized by its shimmering iridescent greens and blues—they shift and sparkle, reminding me of the magic in every moment and the incredible gifts given to us from the earth. Also known as Spectrolite, this gemstone is a Felspar mineral and can also be grey, black, or white in color. Labradorite’s healing properties work with the third eye and crown chakras and have the ability to raise your consciousness and bring transformation into your life—unlocking gifts, opening up psychic abilities, intuition, and raising your vibration. Once you’re vibing in a higher frequency with Labradorite, you will notice synchronicity, serendipity, and good luck showing up in your life. 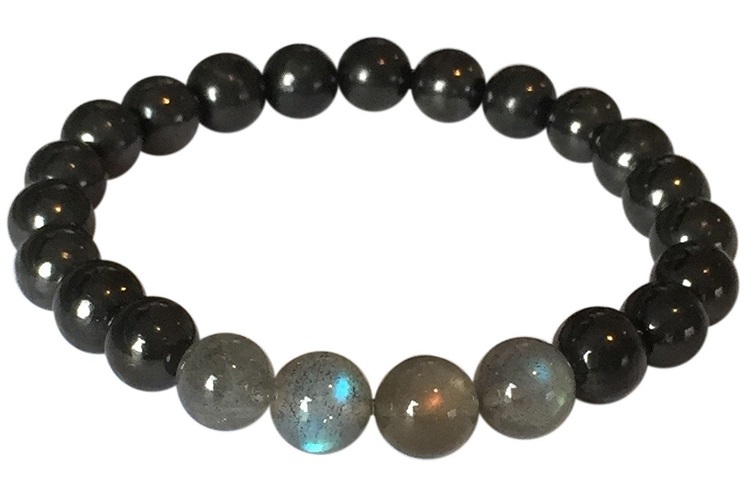 Labradorite is a strong protective stone, repelling unwanted energies, removing psychic debris and negativity. 4. 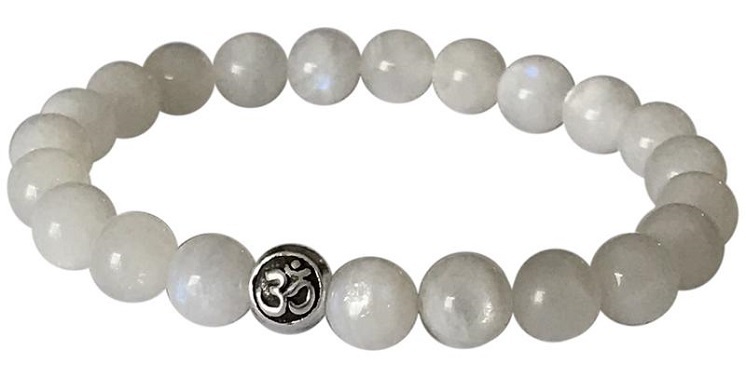 Moonstone is a captivating gemstone that opens up the heart chakra; bringing love and connecting one back to their inner self. Moonstone’s stunning iridescent color is a constant reminder to us about the miracle of our existence and life in this world as well as reminding us to be present and mindful. Working with moonstone begins to unlock the Goddess that exists within each one of us. This gem clears and activates the third eye and crown chakras, unlocking intuition and spiritual gifts. 5. Rose Quartz is, without a doubt, the stone of unconditional love. One of my favorite stones because love is the most powerful force in the universe, Rose Quartz both attracts love to us and allows us to give love by opening up our heart chakra. Once we heal our heart, and love ourselves fully, we are then truly able to give love to others, love our lives, family, relationships, animals, the universe, and all of creation. 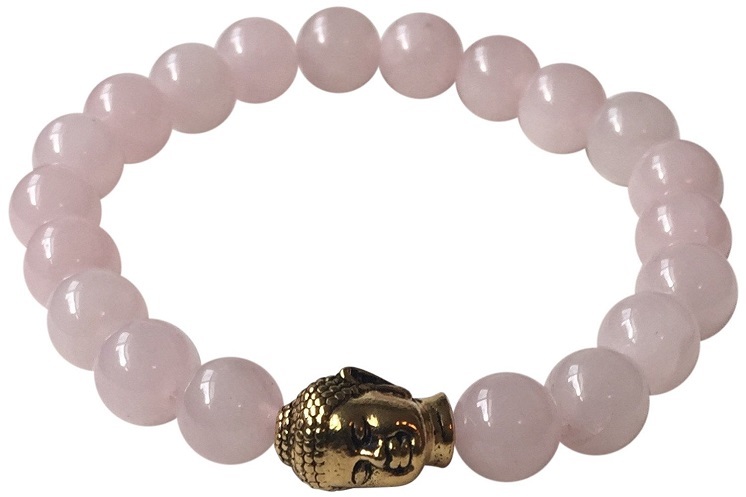 Rose Quartz connects us to the divine perfection of all that is. Rose Quartz helps to clear negative emotions, release stress, calm the mind, and bring back the joy in ones life. This stone is also beneficial for healing grief and sadness. Oh, and pssst…if you happen to be in Toronto, pop into Shaman Sisters Fine Gemstone Jewelry & Crystal Boutique for high quality unique crystals, spiritual tools, and home decor pieces. We’re having our grand opening on September 1, 2018. Located at 308 Lakeshore Rd East Mississauga ON L5G 1H4. Shaman Sisters love creating jewelry with genuine gemstones that bring positivity, healing, empowerment, and protection. They handcraft each and every piece with their love, positive intentions, and send them off with the highest vibration. They believe that every single person can reach his or her dreams and fullest potential, and they want to invite you on this journey as well. They source semi-precious gemstones, sacred materials and unique treasures from around the world, always practice fair trade principals, and support indigenous communities. Visit their website.